HARLINGEN — Port of Harlingen officials are seeking to reinstate a tax that lapsed in 1997 to generate funds for maintenance and operations at the facility on the Arroyo Colorado. Port officials floated the idea of bringing the tax back — the Cameron County Commissioners Court must still approve it — in 2014 and again in 2016, but a port tax which is levied on some county homeowners wasn’t instituted. The proposed port tax hike of 3 cents per $100 valuation would be paid by residents living in the Harlingen Consolidated Independent School District, the Rio Hondo Independent School District and southern Willacy County. So on a home with a $100,000 valuation, the added tax for people living in those districts would amount to $30 a year. In all, the tax would generate more than $1 million annually for the port. The Port of Harlingen is where most of the Valley’s gasoline and diesel supplies arrive, and are distributed via rail or tanker truck up the Valley. Smith said a significant new amount of traffic at the port is diesel and gas destined for Mexico, which has begun importing fuel to offset declines in production from its aging refinery system. “Just last month we received 9.9 million gallons of diesel, all going to Mexico,” he said. “And since the beginning of our fiscal year this year we’ve pretty well been averaging a total of 7.5 million gallons” per month. All of this additional port traffic, although welcome, creates what Smith called “wear and tear” on the facility necessitating higher maintenance costs. 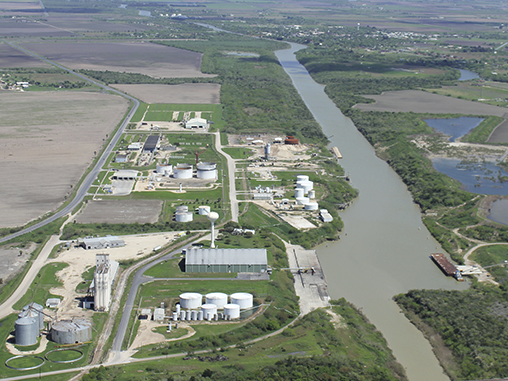 The Port of Harlingen lies 25 miles upstream from the Gulf Intracoastal Waterway on the shallow Arroyo Colorado. Ocean-going barges bring in gas, diesel, sand, cement and fertilizer, and haul off cotton, grain and sugar. These craft have a draft of about nine feet, and the arroyo has to be maintained at an authorized depth of 12 feet to safely allow barge traffic in and out of the port. While the U.S. Army Corps of Engineers is responsible for dredging the Arroyo Colorado from the turning basin at the port to the mouth of the river along the gulf, funding for dredging the docks and other areas within the port falls to local port officials. Smith was seeking a resolution from the HEDC board backing his proposal to reinstate the port tax, and the economic development board gave its unanimous approval for his effort yesterday. The port tax has been on the books for years, yet was only invoked in the 1940s and the 1980s. In 1989, the port reinstated the tax until 1997 and then it was allowed to lapse. “The arroyo crested here in the turning basin at just shy of 24 feet,” Smith said. “It was pretty close to coming up over our docks here, closer than we have been in a long time. “With all that water comes silt, sediment and debris, and as it’s rushing down the narrow arroyo before it gets to the turning basin, once it hits the turning basin that flow slows and all that stuff just kind of settles down and around our turning basin and creates some issues for our barges to be able to breast up to the docks or mooring pylons,” he added. In addition to the HEDC resolution of support granted yesterday, Smith noted the Harlingen Area Chamber of Commerce also issued a statement of backing to reinstate the port tax. The port was created in 1926. It is the second-largest port in Cameron County after the Port of Brownsville. It is sited on more than 2,000 acres of land with 650 feet of dry cargo wharf, 100 feet of dry bulk wharf and five docks. Located on the Arroyo Colorado, the port facilitates trade bulk and liquid cargo as well as petroleum in Texas, Louisiana and Mexico.